Return Address Mail Stamp Personalized Self Inking Stamp, Size (Approx.) 7/8″ x 2 3/8″ (22mm x 58mm.). Stamp Body Is Made With Sturdy Materials, The Best In The Industry! Cut With The Highest Quality Laser To Ensure A Sharp Impression Every Time! Self Inking Stamps Come Inked With Black, Purple, Blue, Green Or Red Ink, Enough To Use 20,000 Times Before Needing To Be Refilled. 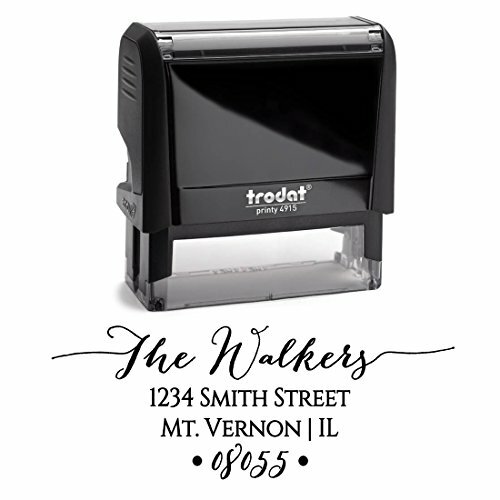 To Purchase, Select The Ink Color Option Above, Or A Wood Handle (Requires A Separate Ink Pad) Press “Customize Now” All Of Our Stamp Self Inking, Business Office Stamps, Come Ready To Use Out Of The Box! Use For Name Address Labels, Return Address Labels, Personalized Address Labels And Wedding Address Labels Purchase A Custom Stamp That Can Be Used Over And Over! Our Personal Office Stamps, Personalized With A Stylish Font Are Made Here In The USA And Created The Day You Order! We At Pixie Perfect Stamps Pride Ourselves On Our Great Quality And Super Fast Shipping For A Custom Made ProductReturn Address Mail Stamp, Select Above COLOR OPTIONS For Black Blue Green Purple Or Red Self Inking Stamp Or A Wooden Handle (Requires A Separate Ink Pad). Click Customize Now, Fill In The Custom Details. If The Customize Button Is Not There (Add To Cart And Send Us The Custom Word Or Name With A Maximum Of 16 Characters) If You Do Not See What You Are Looking For, In Our Store Front… Please Send Us A Message For A Custom Created Stamp, We Can Even Do Logos Or Your Own Handwriting! These Personalized Self Inking Custom Stamps Are 100% Made In The USA, The Stamp Size (Approx.) 7/8″ x 2 3/8″ (22mm x 58mm. )We Have Super Fast Processing And Shipping – Our Custom Rubber Stamps Are Made In House And We Aim To Have Your Order Made And Out For Shipping Within 24 Hours Of The Order Being Processed! These Rubber Stamps Should Last 20,000 Impressions Before Needing To Be Re-Inked – Any Difficulties, Just Let Us Know! High Quality Materials Used, The Stamp Body Is Made With Sturdy Materials, The Best In The Industry! Cut With The Highest Quality Laser To Ensure A Sharp Impression Every Time. We Offer Different Color Options For A More Unique Custom Stamp To Suit You, Black, Blue, Green, Purple Or Red. If You Need Something Different (Maybe Orange Or A Larger Size) Please Send Us A Message – We Can Do Just About Anything! Custom Self Inking Stamps Are A Great Gift, For Business Owners, Work Colleagues, Clerical Office Jobs, Oh And Of Course – Ourselves! Plenty Of Uses For These Unique Personalized Stampers. Great For; Return Mail, Signing Off Letters, Business Company Address Change, Christmas And Holiday Cards, Envelope Signing, Embossing Creations And Card Making – The List Is Endless! Also Great For Using Instead Of Address Labels, Return Address Labels, Personalized Address Labels And Wedding Address Labels – Save Money And Time! If You Would Like A Different Font, Increase Size, Add Your Own Handwriting Or Logo – Please Send Us A Message With Your Personalized Request And We Will Be Sure To Find A Solution To Help! Pixie Perfect Stamps Pride Ourselves On Quality And Care For Our Customers. If you have any doubts about this Return Gift, you can make a comment below, we try to solve the user queries as soon as possible.